SAN FRANCISCO—Two years ago, Sunny Guo, a then 47-year-old Chinese housewife, came alone to America to start a new life, one free of religious persecution. She was fleeing repeated detention and torture by the Chinese Communist Party in its attempt to break her will so she would give up her faith. Through it all, Guo never wavered in her belief in Falun Gong, a traditional meditation practice. Guo’s exploration of Falun Gong, also known as Falun Dafa, began in 2009 after reading Zhuan Falun twice, which is the main text for the practice. “It teaches you how to be a good person,” she said. Four standing exercises along with a sitting meditation are the physical components of Falun Gong. But the practice also requires raising one’s moral character through living by the principles of truth, compassion, and tolerance. In 2011, Beijing police illegally arrested Guo because she would not renounce her belief in Falun Gong. This resulted in a month of inhumane treatment at a detention center followed by a hellish 18 months in the Beijing Women’s Forced Labor Camp. Even after serving the prescribed time, the persecution continued once she was released from the labor camp. The 6-10 Office, an agency charged with eliminating the practice of Falun Gong, abducted her from her home. She endured another month of mental torture in a brainwashing center. 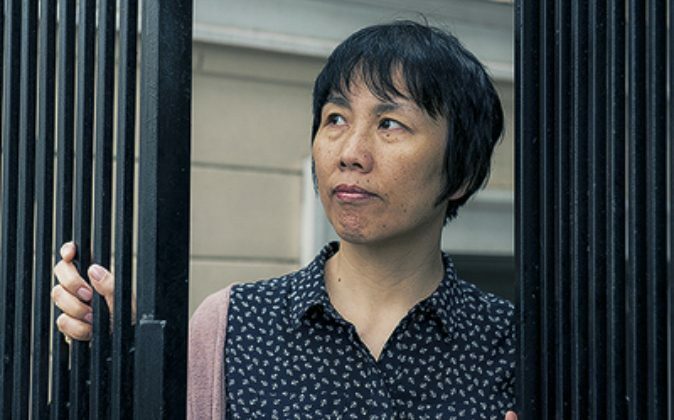 Once released on July 11, 2013, Guo and her husband moved, hoping to put some distance between themselves and the authorities. 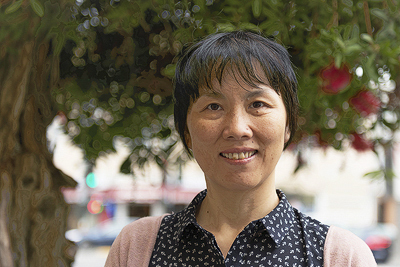 In May 2014, Guo came to the United States, and a year later, her husband joined her. Her captors had a clear purpose for the inhumane treatment. They want Falun Gong practitioners to suffer until they cannot endure it and renounce their faith. “They wanted me to give up what I believe. I believe in truthfulness, compassion, and forbearance,” Guo said. They also persuaded her family to pressure her to give up Falun Gong. And they tortured her. In the forced labor camp, she was required to stay in a fixed position with her hands on her knees, heels together, looking forward, while sitting in a child’s plastic chair for days on end. The longest period was for 18-19 hours straight (minus a few minutes to eat and go to the bathroom). She was not to close her eyes or move her head or body in any way. “You suffer a lot. It makes you feel like one second [is] just like one year,” she said. During this time she was constantly monitored by police or by criminals. The first set were a gambler who sat on one side of her and a prostitute on the other side. “If I moved, they shouted at me, and if I still wanted to move, they reported to the police,” Guo said. Then the police shouted and threatened and bullied her even more. She was treated differently than the others in the labor camp. They were stricter and harder on her. For example, ordinary criminals were in bed by 10 p.m. while Guo was not allowed to sleep until midnight and then was forcibly awakened at 4:3O a.m., several hours before the others. After arriving in America, Guo dedicated her life to sharing her story with the public because she found that many people lack an awareness of the seriousness of the situation in China. “The U.S. people don’t know about the persecution happening in China, even though the persecution has lasted 17 years,” she said. Guo feels it’s her mission to tell people in the free world about the persecution because it has deeper implications. “This is not just related to us. It is related to everybody, every life in this world,” she said. “To persecute a group that believes in truth, compassion, forbearance is really, really evil. If we don’t say no to the evil, … that maybe [will] happen to everyone,” she said. Horrifying as it is, it has taken a decade for the U.S. government to act on “persistent and credible reports of systematic, state-sanctioned organ harvesting from non-consenting prisoners of conscience in China.” On June 13, 2016, Congress unanimously passed House Resolution 343, which condemns forced organ harvesting of prisoners of conscience, which are mainly Falun Gong practitioners, and other religious and minority groups in China. Soon after the resolution passed, a 2016 update was released on the previous studies on organ pillaging first described in Bloody Harvest (Kilgour & Matas) and The Slaughter (Gutmann). The investigators found that there were up to 1.5 million transplant operations since the persecution of Falun Gong began. The investigators estimate 60,000 to 100,000 organs are harvested each year, mainly from prisoners of conscience, to satisfy the thriving Chinese organ transplant industry. Five hundred Chinese hospitals are participating in this slaughter and many of the organs go to foreigners in need of a transplant. After reading Bloody Harvest, Guo was startled to realize that she too could have had her life taken for her organs. The threats police had made to her saying she could be transferred to certain specific locations, which were among the 33 holding facilities associated with the transplant system. Twice blood was drawn from her, which investigators have shown is an indicator of being monitored for a possible match for a transplant recipient’s needs. Guo adhered to her faith under the harshest of conditions for more than 20 months, and her husband did not abandon her under the pressure from authorities, fearful neighbors, or family. Her husband could not even confide in colleagues or friends about his plight or that of his wife while she was detained in the forced labor camp. A lot of pressure was placed on him by the police and relatives to get his wife to give up her practice. While in the forced labor camp, Guo saw her husband once a month for a year and a half, and then it was from behind a glass partition. “We could only talk through the telephone and look at each other,” she said. Just as it was her faith that provided her the strength and courage to endure the suffering in China, she draws heavily on it once again. Just a month ago, her husband collapsed and died of a stroke at age 45. Under a cloud of grief and all the changes that follow the death of a spouse, Guo has remained true to her mission. On Oct. 22, 2016, she attended a large parade and rally in San Francisco with 5,000 other Falun Gong practitioners around the world to raise awareness about the severity of the persecution and demonstrate the beauty of Falun Dafa.